Standing 442 meters high, take in the breathtaking view while you enjoy a sumptuous breakfast at the world’s highest restaurant, At.mosphere, Burj Khalifa. 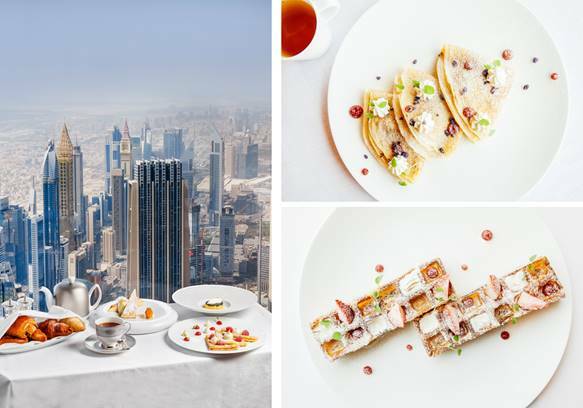 Indulge in savoury and sweet dishes from the breakfast menu, relished with stunning panoramic views of Downtown Dubai from level 122 of the iconic Burj Khalifa. Choose from the Decadence Menu complete with continental breakfast dishes including fresh and seasonal entrées such asExotic Fruit Platter, French Pastry Selection, Cold Cuts and Fine Cheeses and main course delicacies such as Organic 3 Egg Omelette, Scotch Egg with Ratatouille and Braised Lentils, Savoury Crêpe with Char Siew Chicken and Seasonal Mushrooms, Waffles and Brioche French Toast. Breakfast enthusiasts can also order à la carte for flavorful dishes such as Beetroot Salad, Kinglas Smoked Salmon, Slow Cooked Peking Duck with Braised Tofu, King Crab and Lobster Cannelloni and Sweet Crêpe with White Chocolate. Guests can also reward themselves with exclusive breakfast signatures. Not forgetting the little ones, spoil them with an exceptional mini breakfast designed especially for the youngest guests. The picturesque breakfast experience at At.mosphere, Burj Khalifa is ideal for professionals preparing to seize the day and families wanting to share delightful dishes in a memorable setting. Price: Decadence Menu – AED 342 per person (UAE residents can enjoy 35% discount with their Emirates ID) and À la carte – Dishes start from AED 69. Children below 5 years can dine for free (ID required with date of birth). Children aged 6-10 years are entitled to 50% on Decadence Menu only (ID required with date of birth). T&Cs: All ages are welcomed. A la carte available with a minimum spend of AED 200 per person (window tables are subject to availability upon reservation). Only soft beverages will be offered during breakfast. 35% discount on Decadence Menu for guests with a valid Emirates ID card.